A fundamental album released in 1966 that determined the way Rocksteady was going to journey. In 1966, Rude Boys were at the peak of the fame with their notorious behaviors, while Ska gradually started to slow down its tempo. This album paved the way for a newborn music, Rocksteady, with rather slower and tighter rhythm approach. This album should be considered as one of the ten most important albums in Reggae history. The descent from Ska, which had its derivation from Jazz or Rhythm and Blues, to Rocksteady, with its various potential elements which would be passed to the next decade of Reggae, has been allegedly created in this album with Trinidadian guitarist Lynn Taitt and his band The Jets as the backing band. 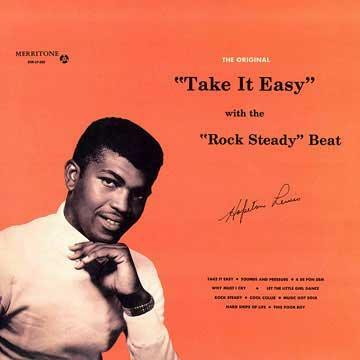 Entitled “Take It Easy With The Rock Steady Beat!”, most of the tunes featured in this album were written for praising dancehall as if he’d have known this genre was going to rule the dance floors. Among the tunes in this album, “This Music Got Soul” was the coolest of all and called out the dawn of the Rocksteady era. This tune had a huge influence on the future developments of Reggae music. No.19 at Total Ranking on Apr 1, 2015. No.2 at Genre Ranking on Apr 2, 2015. No.2 at Sub Genre Ranking on Apr 5, 2015. No.2 at Format Ranking on Apr 2, 2015.